I published this photo once before but it was just too perfect for the Weekly Photo Challenge: Zigzag. Thank you Troy 🙂 It’s a funny story…I had taken a shot of this same stairwell when I lived in Ann Arbor but, like most of my captures, it went into the “waiting to be processed” folder. When it was time to work it, I realized that you could see my full reflection. I tried to process it out but couldn’t and don’t you know, by that time, I’d moved away from the area! I sought to rectify the mistake on a subsequent visit. Of the few shots I took, I thought I would like the empty stairwell best but it didn’t turn out that way. The fellow added a whole new element to the feel of the picture and I knew he belonged there. Very interesting photo. 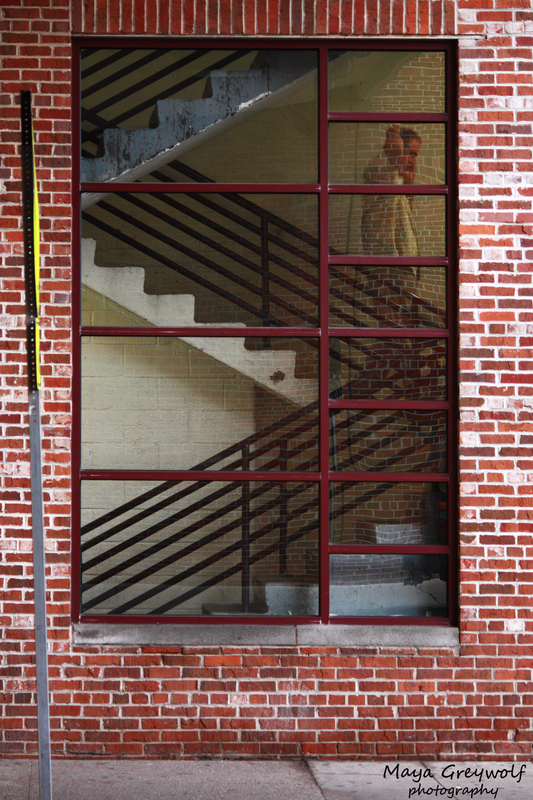 Escher-esque, well composed and I like how the linear steel window framing echoes the brickwork. Am I seeing a reflection of brick work on an opposing wall, or is the flowing pattern of masonry something added to the photo? A great compliment for me considering Escher is one of my all time favorite artists! Yes, that is a reflection of brickwork (read my response to Troy to see how the reflective properties of that window have given me grief!) and it adds an interesting textural element doesn’t it? Wonderful photo! I love the rigid straight lines of the brickwork and windows, juxtaposed with the distorted lines of the bricks behind you. I have always tried to take pictures without people in them, but I’m coming to see the added depth they add. This is definitely the case here! And scratching his head, heh, heh. Zig-zag doesn’t get any more perfect than this! Well spotted and captured!